Diabetes is a serious health condition that affects many people in the United States. According to the American Diabetes Association (ADA, 2017) 30.3 million Americans, or 9.4% of the population, had diabetes in 2015. Of those, 8.1 million, or 27.8%, do not even know that they have it. Every year 1.55 million are diagnosed with diabetes (ADA, 2017). Diabetes is considered by many people to be one of the most psychologically demanding medical conditions. Diabetes is a chronic disease, and treatment often requires significant changes to well-entrenched behavior and habits, at times without an immediate payoff. In addition, people with diabetes often experience significant emotional concerns that can have a significant impact on a person’s ability and willingness to engage in self-care behavior. 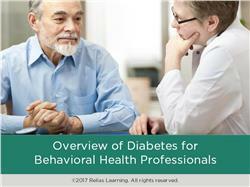 In this course, you will learn about the types and complications of diabetes, treatment considerations, and how diabetes and behavioral health issues can interact. With the number of people with diabetes in the United States increasing every year, it is possible that you may currently be seeing, or will see, a person with diabetes in your office (for therapy). As a behavioral health professional, you may play a role in helping a client with diabetes manage the behavioral and psychosocial challenges that can be associated with diabetes, even if diabetes is not one of the reasons that they present for treatment. This course will give you some important information that will help you as you treat clients who have diabetes. DC-RN -- District of Columbia Board of Nursing Approved Continuing Education program (CE Provider #50-290). 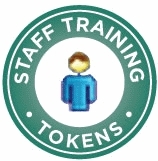 Nurses will receive 1.25 contact hours for participating in this course. Florida Board of Nursing CE Provider #: 50-290 Nurses will receive 1.25 contact hours for participating in this course. Locate support resources that might be helpful for your clients with diabetes. The target audience for this course is: entry and intermediate level Professional Counselors; entry and intermediate level Social Workers; entry level Nurses; in the following settings: Health and Human Services.